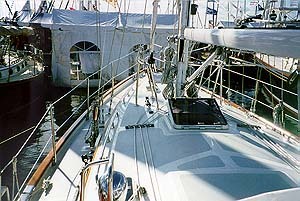 Aft of the cockpit on the Pacific Seacraft 40. This photo shows the anchor roller provided for an stern anchor. A very nice detail. This photo of the Pacific Seacraft 40 shows the anchor platform/bow sprit fabrication. This platform looks very sturdy. 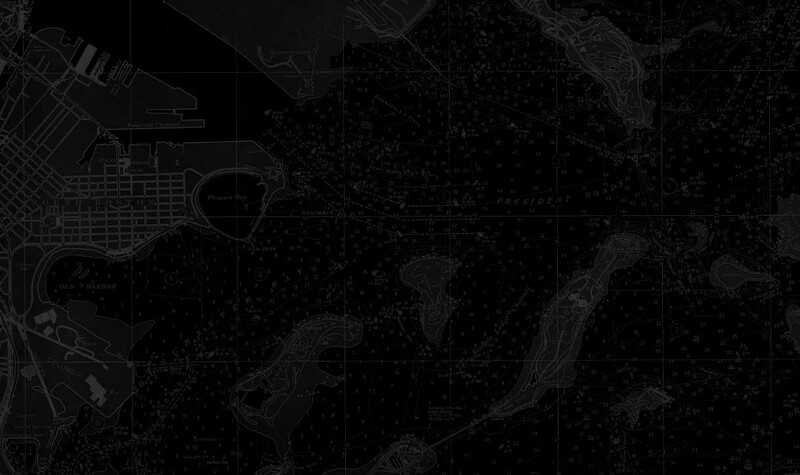 The side decks of the Pacific Seacraft 40 are entirely surrounded by bulwarks. The lifeline stanchions are bolted to the bulwarks and the side decks are drained by scuppers at the lowest points. 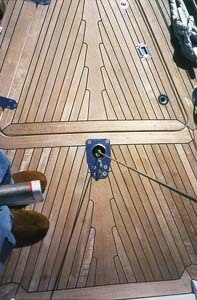 This photo shows the aluminum fabrication that transfers the shroud loads from the deck to an internal bulkhead. This piece is accessible via lockers over the settees. 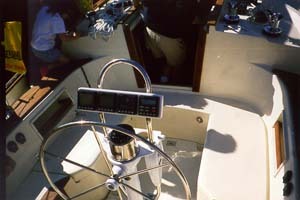 The cockpit of the Pacific Seacraft 40 is very small to prevent swamping in a following sea. Note the harness attachment point at the forward end of the cockpit well. 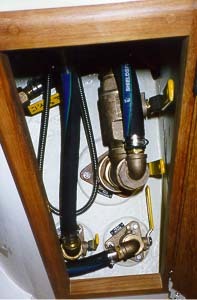 The seacocks of the Pacific Seacraft 40 are proper bronze ball valves, clearly labeled double clamped and easily accessed. All builders should note this detail. Note the increased laminate thickness in way of the seacocks. 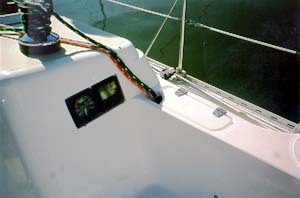 This is the forward end of the cockpit of the Saga 43. The tails from the sail controls are nicely stowed in a dedicated bin. 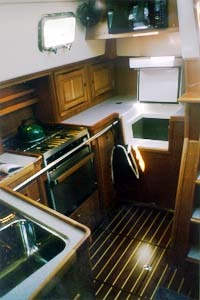 The galley of the Saga 43. Note the ice box lid. This design allows one to reach items that inevitably find their way to the far corners of the box. 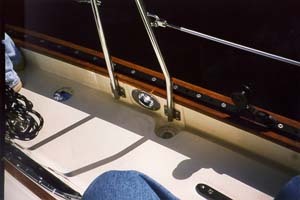 Molded-in can holders in the deck of the Santa Cruz 52. One example of the nice detailing on this boat. 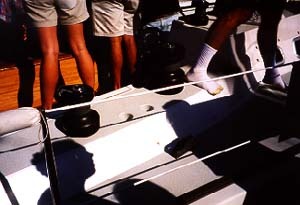 I don't remember on which boat this was featured, but running the control line through the jib track is a slick idea. 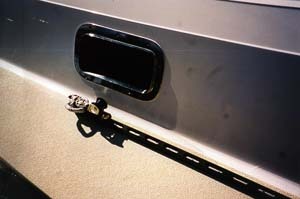 It keeps it out of the way and reduces tripping hazards. 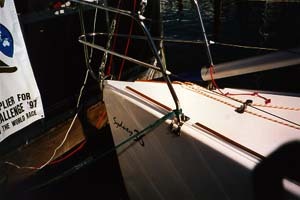 The removable inner forestay fitting on the Swan 56. Note the lined, suede slippers provided by Swan for boarders. Much nicer than sliding around in stocking feet, and they prevent toe stubs, too! Anybody for a swim? 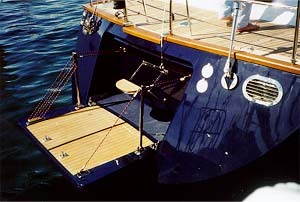 Part of the Swan 56's transom folded down into a swim platform. This feature was nicely executed on this boat. Then again, what isn't on a Swan? The Syndey line of yachts, built in Australia, is new to this country. 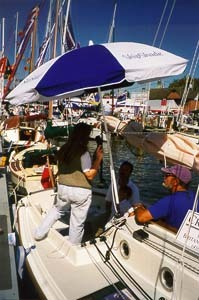 The Sydney 36 is a racer/cruiser, with emphasis on race. However, this boat had a very accommodating interior. While it wasn't decked out in teak or cherry, it was quite comfortable. 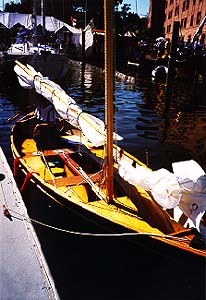 The cockpit arrangement, shown here, shows the dual purpose nature of the boat, with seats for cruising (though they could be wider), and wide side decks and a large well for the racing crew. 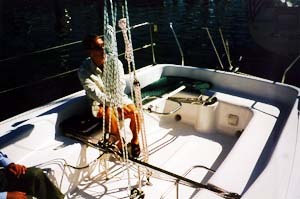 Note the mainsail and traveler controls are within reach of the helmsman, like the J/32. This cockpit seems to work better than the one on the Baltic 50. 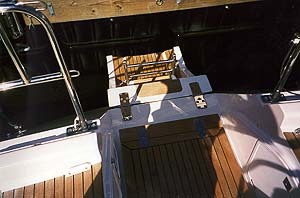 The bow pulpit of the Sydney 36. 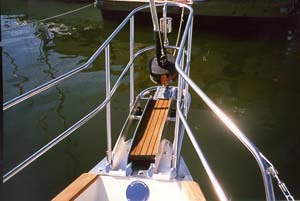 The stanchion and pulpit bases wrap around the deck edge to provide a large bolting area. This swim platform is a feature of the Westerly 43 (I think). 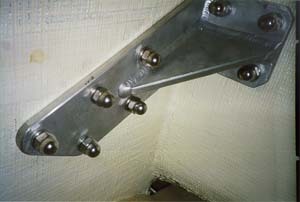 A ladder attaches to the fittings on the after edge. The block and tackle arrangement avoids the complication, expense, and weight of the hydraulic set-up found on other boats. 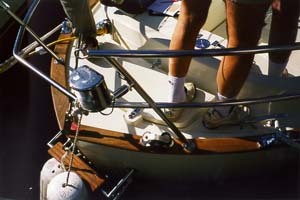 The Shipshade sun umbrella plugs into the top of any winch. like running an obstacle course. 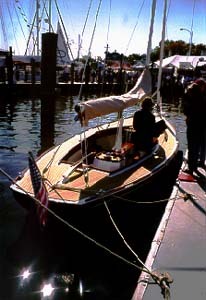 A small daysailer decked out in varnished an oiled wood trim. Though beautiful, the price on this boat is astronomical.